Simplex Inter Process Control (IPC) - simplexnumericas Webseite! 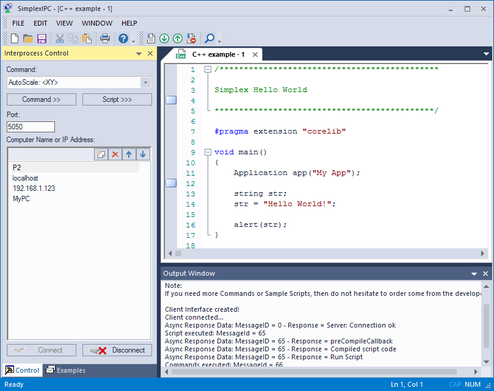 SimplexIPC is an external Microsoft Windows application to control SimplexNumerica remotely from outside. The app is called Simplex Remote Control or short SimplexIPC (Simplex Inter Process Control). Use SimplexIPC to write different C++ scripts in AngelScript in the same manner as you would do it inside SimplexNumerica. Then connect to any SimplexNumerica running PC in the LAN IP range and send the script, so that SimplexNumerica on the other PC can compile and run it (certainly you can do it also on the same PC). • Control SimplexNumerica from an external PC. • Control different PCs from one station. • Evaluate different measurement experiments at plant side and store the evaluation file on the LAN, only (and not all or the raw data rows). • Let run standard scripts on a daily base (even perhaps on more stations). • Help other users with executions of any sequences. You can see, based on these bullet points, that it can make sense to use such a tool like SimplexIPC to remote control SimplexNumerica. Please have a look to the programming manual (go to download page). SimplexIPC will be installed together with SimplexNumerica. You can download SimplexNumerica, install it, and then the SimplexIPC icon is on the desktop.